During our pilgrimage, four talks were presented by the pilgrimage leaders, exploring the Avila of Teresa's time, introducing the art of El Greco, providing a personal reflection on the Carmelite charism, and introducing Teresa's mystical writings. All these talks can now be viewed below. Our pilgrimage was accompanied by a 'virtual pilgrimage' on the webpage. To read the reflections, see below. 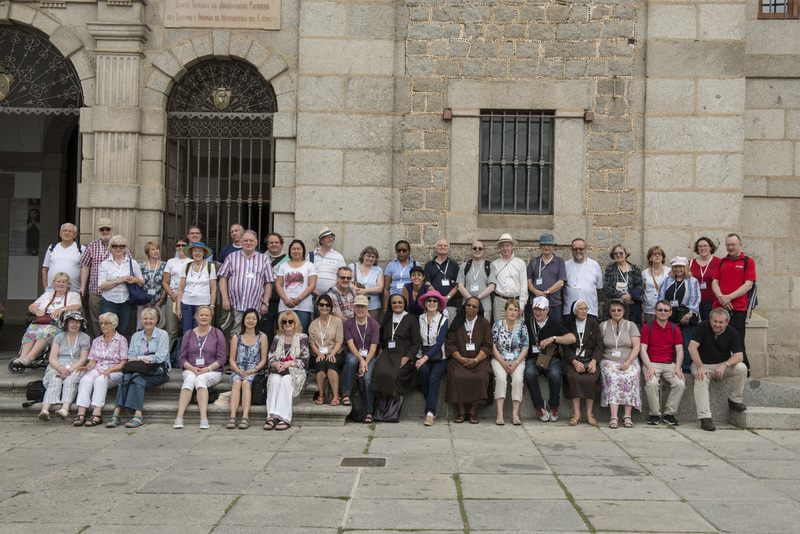 On Monday 31st August, our group of forty-five Teresa 500 pilgrims set out for Avila to follow in the footsteps of the the great saint, visiting and praying at the key sites associated with her life and work. Each day a virtual pilgrimage here on the website accompanied them, reflecting on the meaning and significance of the sites they were visiting, sharing something of their liturgy and offering our own prayer intentions. All quotes from St Teresa’s writings are taken from The Collected Works of St Teresa, (3 volumes) translated by Kieran Kavanaugh OCD and Otilio Rodriguez OCD, and published by the Institute of Carmelite Studies, Washington DC, 1980 – 1987. Extracts from the writings of St John of the Cross are taken from The Collected Works of St John of the Cross, translated by Kieran Kavanaugh OCD and Otilio Rodriguez OCD, Institute of Carmelite Studies, Washington DC, 1991. "Seek the welfare of the city where I have sent you into exile, and pray to the Lord on its behalf, for on its welfare yours depends." It was this commitment to the world in all its needs and struggles which so fired St Teresa with apostolic zeal, a willingness to pour out her life in prayer and works for the good of others and for the building of Christ's Church. Truly Teresa was a citizen of the world and it is remarkable that her love of God and her thirst for his companionship turned her not from the world but towards it. As we return home and resume our daily tasks we ask Teresa for fresh eyes to see Christ's presence in each of the souls among whom we dwell, to see his purpose in each of the tasks we undertake. This new vision and renewed energy must truly be the legacy of any spiritual experience. As Teresa teaches us at the end of the Interior Castle, 'This is the reason for prayer, my daughters, the purpose of the spiritual marriage: the birth always of good works, good works' (Interior Castle, VII. 4.6); and again, 'This is what I want us to strive for, my Sisters: and let us desire and be occupied in prayer not for the sake of our enjoyment but so as to have this strength to serve' (Interior Castle, VII.4.12). Taking Teresa's words to heart, let us then set ourselves to these works with fresh energy and a deepened love for our neighbour. We know from the testimony of Blessed Anne of St Bartholomew that, as Teresa lay dying in Alba de Tormes, she said with characteristic directness and simplicity to the Lord whose presence she so imminently expected: 'It is time to walk.' Let us too walk courageously and confidently with the Lord, labouring to build his kingdom on earth, in confident expectation of our final dwelling place in heaven. "My Lord, it is time to walk. Very well, Your will be done!" We pray for the homeless, the refugee and the exile. We ask that they may find a place of home among us. May our welcome to them reflect all we anticipate of our common citizenship in the kingdom of heaven. We give thanks for all we have received during these days of pilgrimage. We ask that these graces may flow out to all we know and love, all we hold in our hearts, all for whose needs we pray. We give thanks and praise to you. Heavenly Father, we thank you for the grace of this time of pilgrimage. Bless those who have been our companions on the road. Reward those who have given us their hospitality. Help us to leave this place with a deeper love of you and others. Keep us safe on our journeys home, and one day reunite us in our heavenly home, with Teresa, John and all the saints of Carmel. We make this and every prayer, through Christ our Lord. Amen. On the last day of the pilgrimage our pilgrims travel nearly seventy miles north west of Avila to the city of Salamanca, and then a further thirteen miles south to Alba de Tormes. Both are sites of Teresa's original foundations; Salamanca, her seventh foundation was established in November 1570, and Alba de Tormes just a few months later in January 1571. Salamanca is, of course, famous as a university city and boasts the West's third oldest university after Bologna and Oxford. When Teresa arrived, it was at the height of its fame, renowned for its teaching of both canon and civil law, and promoting economic and spiritual rights. Ignatius of Loyola had studied there in 1527, and St John of the Cross spent four years completing his theological studies from 1564-68. As an intellectual hub for some of the greatest minds in Europe, the rest of the city too was thriving, bustling with students and catering for their needs. In fact, when Teresa arrived to make her foundation she found that the house rented for her was still occupied by students, and wryly observed on their departure that 'they must not have had a gift for cleanliness' (Foundations, 19.3)! Salamanca also boasts not one but two cathedrals, dating respectively from the twelfth and sixteenth centuries. Our pilgrims begin their visit there, before walking through the university district with its collection of Gothic, Renaissance and Baroque buildings. 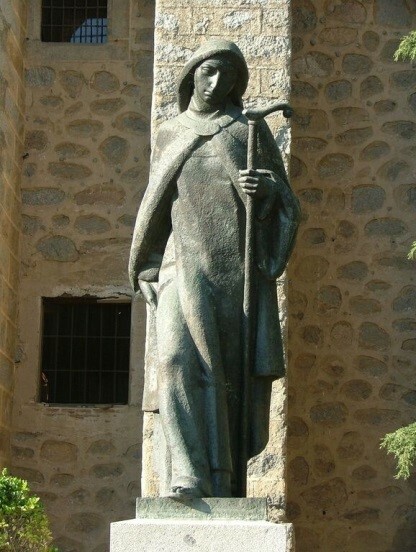 In the late afternoon the pilgrims will travel to the final location of the pilgrimage, Alba de Tormes, where Teresa arrived exhausted and terminally ill on 21st September 1582, and from where she finally departed for heaven just thirteen days later on 4th October 1582. When Teresa is writing her account of the Salamanca foundation in the Book of her Foundations she breaks off the narrative to give some important advice which has occurred to her for prioresses. We tend to think of the typical Teresian virtues as being along the lines of her famous 'determined determination': qualities such as zeal, courage, perseverance and the desire to do great things for the Lord. Here, however, Teresa's counsels are marked by a mother's kindness. She is forming the next generation of leaders for her communities, and new priorities and sensitivities come to the fore; those of gentleness, discretion, and attentiveness to individuals and their particular needs and abilities. Above all, Teresa teaches her prioresses that simple adherence to the Rule and the Constitutions of the reform is paramount. Teresa is adamant that her vision of a return to the primitive Carmel is not to be obscured by the overlaying of additional and unnecessary practices, devotions and mortifications. '[I] would want them to observe the rule,' she writes, 'for with that there is plenty to do; and the rest should be done with gentleness' (Foundations, 18.7). For Teresa, the Rule and Constitutions are the path by which the sisters should be led (Foundations, 18.6). This simplicity of vision and practice are part of Teresa's endowment to her communities, and it was to be defended at great cost by the prioresses who took the Teresian Carmel out from Spain into the rest of Europe. Much suffering was to be endured by the likes of Anne of Jesus and Anne of St Bartholomew in preserving this clarity and simplicity of the original Teresian charism. "what do you think that abode will be like where a King so powerful, so wise, so pure, so full of all good things takes His delight? I don't find anything comparable to the magnificent beauty of a soul and its marvellous capacity." As such, Teresa knew that each soul entrusted to her care in her lifetime, and now under her spiritual guidance, is of immense value. No wonder that she would be willing to 'die a thousand deaths' to save a single one. And no wonder that in her counsels to prioresses she warns them not to presume that they understand a soul all at once, but to honour the Lord's unique and precious work in each sister, supporting and guiding them along the way in which the Lord is leading. Teresa guardian of souls, pray for us! Open our eyes to see your glory. Open our mouths to proclaim the Good News. Open our minds to new horizons. We pray for gentle hearts; that we may ever honour the work of grace being accomplished in each soul we meet, and lend ourselves willingly to all that God would bring to completion in us. We pray for the dying; that they may know God's love and mercy, that they may journey in confidence into his open arms, that the peace of Christ and the new life of his resurrection may be their eternal gift. O God, by whom we are redeemed and receive adoption, look graciously upon your beloved sons and daughters, that they may receive true freedom and an everlasting inheritance in your kingdom. We ask this through our Lord Jesus Christ, your Son, who lives and reigns with you in the unity of the Holy Spirit, one God, for ever and ever. Amen. Saturday was a free day or a 'desert day' for the pilgrims.There was also a medieval fayre in the city and some of our pilgrims went to take a look. Today is a 'desert day' for the pilgrims in Avila; a day of silent prayer and reflection providing the opportunity to assimilate all they have experienced so far. The day begins with silent meditation in chapel at CITeS, and continues in silence until this evening. The practice of going out into the desert to seek silence and solitude emerged in the Christian tradition about the same time as the practice of pilgrimage, namely somewhere around the end of the third century AD. The first monks went out into the Egyptian desert, living in single huts or ‘cells’ grouped around a spiritual master from whom they received instruction in the spiritual life. Only as they grew accustomed to the demands of solitude did they go further into the desert to live completely alone, for as the monks quickly discovered, solitude, silence and the commitment to continual prayer make radical demands on the hermit and are not to be undertaken lightly. Indeed, the desert monks soon came to see themselves as engaged in a spiritual warfare, a continual battle with the demons of temptation and self-deception. Despite the hardships involved, the desert or ‘eremitical’ life quickly became popular and small groups of monks established themselves throughout Egypt, Palestine and Syria. Since they were seeking a life of solitude, it is perhaps ironic that they rapidly became something of a tourist attraction with Christians travelling long distances to listen to the wisdom of the desert fathers and experience something of their way of life. Thanks to these visitors, we have various accounts of their lives, and collections of their sayings, which have come down to us through the centuries. Indeed, we know that St Teresa herself had a high regard for the wisdom of the desert fathers and had extracts from their teachings read to her each day. When the Carmelite hermits settled in Palestine around the end of the twelfth century, they established a way of life very much in keeping with that of the first desert fathers: single cells grouped around a prior, with some shared liturgical prayer, but an emphasis on silent, continual prayer in the solitude of one’s own cell. Teresa never wavered in her admiration for these ‘holy fathers on Mount Carmel’ and it is notable that when she seeks to reform the Order she looks not outwards to the many new orders flourishing in the church at the time, but turns her eyes to Carmel’s origins, to its roots in the desert life on Mount Carmel. 'Let us remember our holy fathers of the past,' she counsels, 'those hermits whose lives we aim to imitate' (Way of Perfection, 11.4). At times, Teresa’s esteem for the truly eremitical life led her to long to escape to the desert, although she felt equally strongly the pull of her apostolic work, engaged in the needs of the world and embedded in it. "The soul wants to flee people, and it has great envy of those who have lived in deserts. On the other hand, it would want to enter into the midst of the world to try to play a part in getting even one soul to praise God more." Of course, as Teresa really knew, there is in fact no dichotomy, no conflict, between the life of contemplation and service to the world. Indeed, it was her genius to retrieve in the monastic tradition the idea that the eremitical life is both ecclesial and political; for the needs of the church and the whole world. This too, was one of the key insights of the early desert fathers. These monks knew that in leaving the world they were not abandoning it, but offering their lives on its behalf. The desert fathers understood themselves as standing before God, bringing to him the whole of broken humanity for its healing and redemption. They pleaded for the world, interceding on its behalf, and their privations and penances were undertaken in a radical and generous act of self-gift in the place of the other. Perhaps most importantly, these monks saw themselves as humanity’s representatives, waiting in the desert for Christ’s return at the end of time, that they might greet him in the name of all. As such, the monk knew that his solitude was physical only; spiritually he knew himself to be ‘united with all’ as one early desert author put it. Teresa reclaims this wisdom for her own day, and for ours too. In the first chapters of the Way of Perfection she orients the lives of the sisters at St Joseph’s firmly to the needs of the whole church. ‘The world is all in flames’; their whole lives must be the response they offer to God. As Teresa so clearly understands, the life of prayer and purification to which they have dedicated themselves is not for them alone. Teresa never ceases to insist, ‘If beginners with the assistance of God struggle to reach the summit pf perfection, I believe they will never go to heaven alone; they will always lead many people along after them’ (Life, 11.4). St Teresa of the desert and of the world, pray for us! We pray for steadfast, generous hearts which are willing to submit to the purification of the desert. We pray for pure, attentive eyes, fixed on our Saviour alone; we pray for stilled, hushed minds, listening only for his voice. We ask for the graces of the desert. We pray for our world. We stand alongside it in its suffering; we bring it before God in its need; we ask that our prayers may bring the rain of his grace coursing down on all of humanity. Today our pilgrims spend the fifth day of the pilgrimage in the city of Segovia, about 45 miles north-east of Avila. The city is famed for its architecture and boasts both a major example of Roman civil engineering and the last Gothic cathedral to be built in Spain. In Carmelite history, Segovia is home to two early foundations: the Monastery of St Joseph’s (Teresa’s ninth foundation and established in 1574); and the Discalced friary where St John of the Cross lived as prior for three years and which now houses his tomb. Our pilgrims will celebrate Mass there before returning to Avila this evening. The pilgrims begin their day in Segovia by visiting the famous Roman aqueduct built sometime in the first century AD to bring water into the city from the nearby mountains. This remarkable feat of engineering spans half a mile, with 167 arches constructed from some 25,000 granite blocks. What is extraordinary is that the aqueduct is built entirely without mortar, the whole structure being held in place by the Roman appreciation of the fine balance of stresses and loads which has allowed the arches to stand for two thousand years with little need of repair or conservation. The Romans did not invent the arch – it was already known in a basic form in Persia, Greece and Mesopotamia – but their advanced understanding of the physics involved enabled them to develop its use and it was quickly employed in the construction of bridges, amphitheatres, aqueducts and triumphal arches throughout the Empire. As the Romans knew only too well, the building of successful arches required choosing the best materials, preparing solid foundations and firm side walls, and employing stone masons who could cut the granite blocks with the finest levels of precision. Teresa’s writings, especially those concerning the building of strong healthy communities, are replete with construction imagery; although as she tells us, her first childhood attempts with her brother to build little hermitages in the family garden consistently ended in disaster (Life, 1.5). Maybe it is this memory which leads her to insist on establishing solid foundations for her communities. ‘Prayer must be the foundation of this house’ she tells us (Way of Perfection, 4.9), and to support that the availability of good confessors and wise spiritual directors is essential. Without them, ‘the whole building will be wobbly’ (Way of Perfection, 5.4). For Teresa this responsibility to lay good foundations is not restricted to the first or the founding generation. Like the Roman architects before her, Teresa understood that each layer of the building, each row of arches, each generation of sisters, must bear the weight of those who follow; each generation is in reality the foundation of the next, and must be sufficiently strong and well balanced to bear its load in the edifice as a whole. "What does it profit me that our forebears had been so holy if I afterward am so wretched that I leave the edifice damaged through bad customs? For it is clear that those who come will not so much remember those who lived many years ago as those they see before them." As such, each sister, through fidelity, integrity and a generous spirit, must ‘strive to be the kind of rock on which the edifice may again be raised’ (Foundations, 4.7). This is as true for our families, parish communities and secular and tertiary orders as it is for the houses of religious for whom Teresa was originally writing. Each of us, as vital stones in the structure, must bear the load needed in the work of building Christ’s church; sustaining, supporting and interlocking with the other living stones which surround us. "You should understand that those who are in the monastery are craftsmen placed there by God to mortify you by working and chiselling at you. Some will chisel with words, telling you what you would rather not hear; others by deed, doing against you what you would rather not endure; others by their temperament, being in their person and in their actions a bother and annoyance to you; and others by their thoughts, neither esteeming nor feeling love for you." Being purified in community (whatever form that community takes) will involve the constant chipping away of our faults, our delusions and our self-satisfaction. Only this will perfect our love of God and neighbour, emptying us out so we can be flooded with divine love. For John, it is this love which acts as the mortar binding together the bricks of the Christian community, and as he more than once tells the nuns of Segovia, where this love is lacking, we must labour to supply it: ‘where there is no love, put love, and you will draw out love’ (Letter 26, to the prioress of St Joseph’s, Segovia). St John of the Cross, craftsman of the spiritual life, pray for us! We pray for ourselves that we may be living stones in the Church, forming a firm foundation for those who are to come, giving thanks always for those who have gone before us. We pray for those who know dereliction and despair at this time. May God’s love fill their hearts with the courage to rebuild their lives, and to trust those who labour alongside them. Father, you endowed Saint Teresa and Saint John of the Cross with a firm desire to labour for you, building strong communities of prayer founded on gospel charity. Do not allow us to disfigure or damage this work, but through our constant will to love one another may we give glory to your name. We ask this through our Lord Jesus Christ your Son, who lives and reigns with you, in the unity of the Holy Spirit, one God, for ever and ever. Amen. The fourth day of our pilgrimage is spent back in Avila itself, visiting the Incarnation, the royal monastery of St Thomas, and the cathedral. When Teresa entered the Monastery of the Incarnation it was still a relatively new foundation, having been established as a full Carmelite monastery only in 1515, the year of Teresa’s birth. The origins of the community go back further, however, to a community of beatas, or holy women, who came together to live a common life under the foundress Doña Elvira Gonzalez de Medina in 1479. At this point, the community was housed in a former synagogue within the walled town, but in 1495 the city council gave them a plot of land outside the walls, the site of the old Jewish cemetery, and the community moved to its present location. Similarly, the Dominican Monastery of St Thomas was still a comparatively young monastery in Teresa’s time. It was founded in 1482, but had quickly become a popular destination for the Catholic monarchs who used the royal quarters as a summer palace. The monastery still contains the confessional where Teresa would make her confession to her Dominican spiritual advisors. In contrast, Avila’s cathedral is the oldest Gothic style cathedral in all of Spain. Building work began as early as 1091 and so the architecture clearly exhibits the transition from the Romanesque to the Gothic styles. It is dedicated to Christ under the title of El Salvador, The Saviour. As Teresa says, this went on year after year, with little consolation or relief. We tend to forget that when Teresa – the great doctor of the mystical life – writes for beginners in prayer, she writes in all sympathy for the pain, effort and dryness they endure. No wonder she set such store by the determination to begin, and the courage to persevere. Yet Teresa can also assure us in all honesty that the beginning of prayer marks a new life, a new way of living in Christ and of allowing him to live in us. Despite all the extraordinary experiences this new life was to bring, Teresa never lost her understanding of the importance of the ordinary, of the significance of fidelity in little things (a doctrine which her spiritual daughter St Thérèse was to take up with such effect), and the crucial victories which are won in the tiny battles to overcome our everyday pettinesses and sinfulness. In fact, when Teresa receives the first impulses to do something great for God, she knows quite clearly that the secret will be in accomplishing this in the little things, in ordinariness. Thus, Teresa’s first resolve is simply ‘to follow the call to the religious life, which His Majesty had given me, by keeping my rule as perfectly as I could’ (Life, 32.9). Even after St Joseph’s is founded, and Teresa is teaching her first community how to live, this focus on the vital importance of the ordinary is not lost. Teresa begins the Way of Perfection saying. ‘I resolved to do the little that was in my power; that is, to follow the evangelical counsels as perfectly as I could and strive that these few persons who live here do the same’ (Way of Perfection, 1.1). The world, as Teresa perceived it all too clearly, is in flames, but the fire will be extinguished most effectively by the daily commitment to charity, life’s little battles of humility and detachment, and the ongoing, unfailing, doggedly persistent fidelity to prayer, here, today, in this place, now. St Teresa of the everyday, pray for us! We pray for the grace to recognise that the here and now matters. We pray for hearts that will respond to the immediate and to the insignificant. May we never cease to find God’s grace in the present moment, and to serve him in the person before us. We pray for the grace to endure the painful process of purification. May we never lose heart, or cease to trust in God’s providential love for us. May we encourage one another, as we journey ever deeper into his vision for our perfect being. Lord God, through the teaching of St Teresa and all the Carmelite saints help us to attain perfect love. May we always live in allegiance to Jesus Christ, and serve faithfully until death him who lives and reigns with you in the unity of the Holy Spirit, one God, for ever and ever. Amen. Today our pilgrims travel 120 miles south-east of Avila to Toledo, known as ‘the city of the three cultures’ in reference to the Jewish, Islamic and Christian communities which have flourished there. The multiple religious and cultural influences are much in evidence in the city’s architecture; the cathedral, for example, is built over the site of an earlier mosque and its floor design is said to reflect the layout of the earlier building. Our pilgrims will be visiting the cathedral, as well as the El Transito Synagogue, and the El Greco museum which celebrates the life and work of the Renaissance artist who completed some of his most important works in the city. Toledo is also significant in the lives of both St Teresa and St John of the Cross. Both their fathers came originally from the city, Teresa’s great grandfather having moved the family to Avila in only 1480. We don’t know whether Teresa ever visited Toledo as a child, but we do know that she was there twice in 1568, engaged in making the foundation in Malagon. Teresa’s reform was flourishing, and even while the foundations at Malagon and Valladolid were in progress, the opportunity for a fifth house in Toledo presented itself. The new monastery in Toledo, dedicated once again to St Joseph, was founded in May 1969 although Teresa stayed only a couple of weeks before setting out to establish the next community at Pastrana. Teresa returned to Toledo in less happy circumstances in 1576. The very success of her reform had provoked antipathies and jealousies, her critics and opponents were now at their most powerful. Denounced to the Inquisition at Seville she had been ordered to retire to one of her monasteries, all thought of further foundations halted and the future of the existing houses in serious doubt. Teresa arrived in Toledo in the June of 1576 and remained there for about thirteen months. Just before leaving she began work on what was to become the Interior Castle, her most mature and accomplished work, taking it with her to Avila and completing it a breathless five months later. At the height of her suffering then, and when all she had laboured for seemed to be in ruins, Teresa produced the masterpiece for which she is perhaps best known, a work which has influenced the lives of countless souls through the centuries. St John of the Cross, too, was in Toledo during his darkest hour. Kidnapped from Avila in December 1577 he was brought to the Carmelite friary in Toledo and imprisoned there for nine long months until August 1578. Locked in a cramped, airless cell he produced some of the most important mystical poetry in the history of Spanish literature. For both John and Teresa then, light came in and from their darkest hour; suffering gave birth to resurrection. There seems to be a strong human tendency to want to tidy up suffering. Most of us have a sneaky suspicion that if we could just get the circumstances right, go into it better prepared or with the right disposition, we might suffer gloriously. We harbour a secret dissatisfaction with our paltry attempts to deal with the inconveniences, burdens and ailments which come our way, and feel convinced, in retrospect, that we could, and should, have done better. As Christians we canonise those who suffer heroically, revering those who bring courage, dignity and faith to the arena of suffering. Those who are broken by the experience of suffering – degraded, humiliated, dehumanised – are much harder for us to deal with. In the Passion narratives, the Gospel of John has Jesus deal almost majestically with suffering: seemingly in command throughout, he ensures that the last details of scriptural prophecy are accurately fulfilled and is more to attentive to the sufferings of others than his own. Mark, the earlier account, offers us a different theology. Jesus prays in Gethsemane distressed and agitated, is too weak even to carry his own cross, and dies in abject abandonment crying out to a Father who is no longer there. The Resurrection concludes both these narratives. Maybe we need to remember that ugly suffering still achieves God’s purpose. We speak of offering our suffering for the sake of others, we believe in the graced-ness of suffering, our faith tells us that God is present within it; but this needn’t mean that suffering is always pretty, or undergone with bravery and fortitude. Sometimes grace is completely obscured; sometimes the darkness of the dark night is impenetrable. This doesn’t mean that God is absent, or that he is not working his purpose through it, but for some of us the light of the Risen Christ may not yet be seen. Teresa, companion in our darkest hour, pray for us. "O my Lord, how certain it is that anyone who renders You some service soon pays with a great trial! And what a precious reward a trial is for those who truly love you if we could at once understand its value!" We pray for those whose suffering seems unbearable and interminable. We pray for those living with chronic sickness, intractable problems or endless worry. We ask that our prayers may touch them in their suffering, that they may know the light of the resurrection through our companionship in the darkness. We pray for ourselves, for the humility to suffer badly. May God take all that we endure into his hands, may he accomplish in us all that he desires, may he lead us to the resurrection in his good time. Loving God, you taught St Teresa that through her sufferings she could serve you, and endowed St John of the Cross with a spirit of self-denial and love of the cross. By following their example may we come to the eternal vision of your glory. We ask this through your son, Jesus Christ, who lives and reigns with you, in the unity of the Holy Spirit, one God for ever and ever. Amen. ﻿﻿As is appropriate for our pilgrims’ first full day in Avila, today’s itinerary concentrates on places associated with new beginnings in St Teresa’s life. The pilgrims begin by visiting La Santa church, built over the house where Teresa was born, and then continue to the Monastery of San José, the first monastery to be founded by Teresa and the beginning of what was to be her reform movement within the Carmelite Order. Teresa was born on 21st March 1515 in the family house situated in the southern part of the city, not far from the medieval walls. Although Teresa’s life was to coincide with a golden era for Avila, with much new building and renovation of the city’s buildings, the church now standing over Teresa’s former home was not constructed until well over a century after her birth. It was built by the Discalced Carmelite friars who purchased the site containing the remains of the de Ahumuda house and began work on the new church in 1629. In order to maintain the original alignment of the family home, the main altar of the church faces north-west. A chapel within the church marks the room of Teresa’s birth, and there is also the small garden in which Teresa played as a child. Teresa’s first foundation, St Joseph’s, was originally a collection of small buildings, of which a number remain, including the kitchens, refectory and cloister. The original chapel was replaced with a new church between 1608 and 1615. The convent is situated to the east of Avila, outside the walls but only a short distance from the city centre. Teresa founded the new monastery on the feast of St Bartholomew, 24th August, 1562 with four new novices receiving the habit and the Blessed Sacrament reserved in the convent chapel. Teresa herself was recalled by her prioress to the Monastery of the Incarnation that same day, and it was not until the December that she was able to take up permanent residence in her new foundation. Here she was to spend some of the happiest years of her life, living in relative peace until August 1567 when she took up the task of making further foundations beyond Avila. During this time Teresa delighted in living with like-minded souls, commenting that it was ‘the most wonderful consolation for me to be able to live with souls so detached’ (Life, 36.26) and fulfilling her desire ‘to withdraw from everything and live my profession and vocation with greater perfection and enclosure’ (Life, 36.5). It was during her time at St Joseph’s that Teresa wrote the Way of Perfection, and her Meditations on the Song of Songs. Our two pilgrim sites today then represent places of new beginning for Teresa; first the place of her birth, and then the initial foundation of her reform movement. Beginnings were important for Teresa and recur as a theme throughout her writings. She understood herself as born for God and given new life through the saving work of his Son. All she lived and laboured for was, therefore, at his service and under his providence, but this didn’t mean that she could simply sit back and wait for things to happen. Teresa was a big believer in making a determined beginning, in the human effort required to get things going, and in the courage that would be called for in the soul who sets out on the spiritual quest for God. As such, Teresa knew how critical the first stages of prayer are. When she sets out her first teaching on prayer in the book of her Life, she spends much time providing advice for beginners, encouraging them not to become disheartened in their labours, and in the Interior Castle she commends those who start out on the life of prayer, commenting that ‘they have done quite a bit just by having entered’ (Interior Castle, I.1.8). Teresa is writing both her Life and the Interior Castle when she is already herself experienced in the advanced stages of prayer, having been gifted with many extraordinary mystical experiences. Yet she knows that in the life of prayer we are all beginners, that there is a constant need to return to the first stages, to root ourselves in humility, in self-knowledge and in the human effort to attend to our God. There is no soul on the journey who is ‘so much a giant that it has no need to return often to the stage of an infant and a suckling. And this should never be forgotten. […] There is no stage of prayer so sublime that it isn’t necessary to return very often to the beginning’ (Life, 13.15). St Teresa of determined beginnings, pray for us! We pray for ourselves; we ask for the humility of beginners, for the grace of fresh starts, for the courage of those setting out on the journey. Heavenly Father, you enable your saints to draw untold resources of humility and charity from the fountainhead, Christ our Saviour. By their prayers, may we never be separated from the love of Christ, in whose name we make our prayer. Amen. The Second Vatican Council reminded the church that we are a pilgrim people, exiled from the Lord and labouring to reach the heavenly homeland which Christ promises us. To be a Christian, then, is to be a pilgrim whether we are participating in a formal pilgrimage or not. We are called constantly to recognise that we are not at home, that the goal of our heart lies elsewhere, that our eyes are fixed on a homeland which is not here. Pilgrimages to such centres as Rome, the Holy Land, or even Avila, are a reminder of this truth, an opportunity to deepen our spiritual life, and a time to journey (even for just a few days) a little more closely with the Lord. Pilgrimage is in fact a common feature of all the world’s major religions, testimony again to the universal human sense of journeying through life. In Christian history, the practice of making pilgrimages emerged in the fourth century AD with the conversion of the Emperor Constantine and as the decreasing threat of persecution made it possible for Christians to engage in public activities. To begin with, pilgrimages were often simply to the tomb of the local martyrs, but the practice of visiting the Holy Land was popularised after the Empress Helena visited Palestine in 326 AD and identified many of the sites associated with Christ’s life on earth. As Christianity spread, the Eastern and Western churches developed slightly different understandings of the meaning of pilgrimage. The Celtic and Eastern churches tended to focus on the aspect of exile and the intrinsic homelessness of the Christian, while Western Christians understood pilgrimage more as the journey to a specific goal, with the intention of doing penance, offering thanks or requesting help such as the cure of an illness. Both these aspects are represented in the Carmelite tradition. Having fled Mount Carmel sometime during the thirteenth century, the early Carmelite hermits found themselves exiles in the West, often regarded as spiritual misfits from a strange country; while St Thérèse made the journey to Rome at the age of fourteen to request the Pope’s assistance in her desire to enter Carmel. Today, our Teresa 500 pilgrims begin their journey to Avila and the places most associated with her life and work. We ask Teresa’s intercession for them, and for us all, that this will be a time of grace for each pilgrim, actual and virtual alike. May it also be a time of thanksgiving for all that we have received from Teresa, especially in this centenary year. St Teresa of Avila, pray for us! May God give his blessing to the family which has gathered here. from its foundation to its covering. and may God’s Spirit alone dwell among us in these days together. We pray for all who travel in God’s name, seeking his will and fulfilling his purpose, may they be richly blessed. We pray for all those who travel through need or desperation. We remember those exiled from their homeland, those fleeing violence and persecution, all seeking welcome and hospitality in a strange land. May they know the mercy of God through us. We ask God’s blessing on our time of pilgrimage. May St Teresa lead us to deeper love of God and closer friendship with his Son, Our Lord Jesus Christ. May the blessings of our pilgrimage extend to all those we know and love. Loving God, by your Spirit you raised up Saint Teresa of Jesus to show your Church the way to perfection. May her inspired teaching awaken in us a longing for true holiness. May our pilgrimage in her footsteps lead us closer to you. Grant this through our Lord Jesus Christ, your son who lives and reigns with you and the Holy Spirit, one God for ever and ever. Amen.